This old house i on the other side of my neighborhood in a lovely area. Today I was out for a quick bike ride and rode past and only suddenly noticed it. Where have my eyes been for past years? Luckily I had my iPhone and did a quick U-turn. I am definately going back to this place with my DSLR and going to get some a lot more shots. I love the white plastic chair on the left and the car in the driveway completely taken over by the brush. Absolutely. I added more contrast and HDR type touch to make it a little rough, and upped the saturation. Looks like a real fixer-upper 🙂 Looking forward to seeing what you do with this subject and your DSLR. I like how you pushed the contrast and saturation levels to bring the green out… it gives a surreal feeling… more like a painting than a photograph. The way you’ve punched the green and red, the overgrown-ness of it all, positively fabulous! Very colorful shot. I love it. Thanks Bashar and thanks for stopping by again. 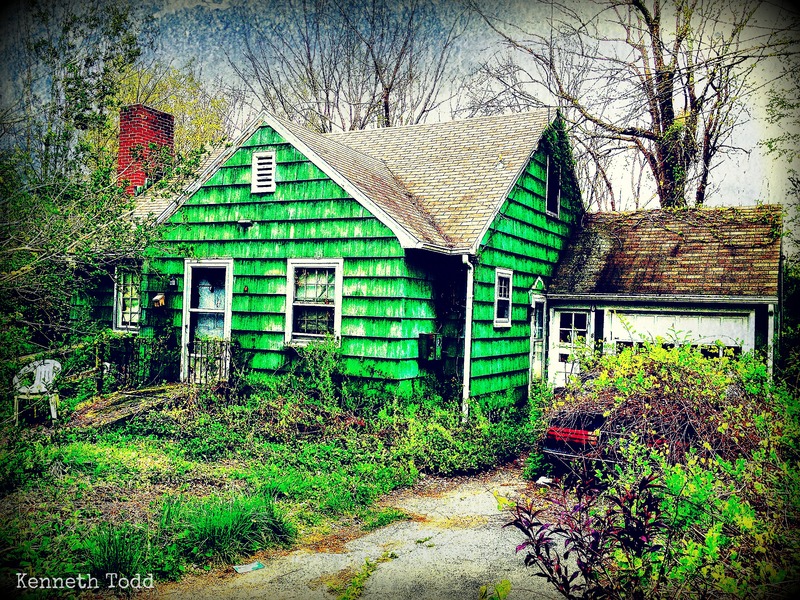 I feel sad to look at abandoned houses. Haunting picture! Liked the colours.